Why is Tahitian Noni® Juice so popular? Why do majority of people drink only Tahitian Noni® Juice? 1. Quantity of pure Noni in a bottle. You can't drink 100% pure Noni juice because of very bad taste. Tahitian Noni International (Morinda) is the only company to give you all the healthy ingredients of the Noni fruit along with very good taste. The only ingredients are Morinda Citrifolia Fruit Puree, Grape Juice, and Blueberry Juice. 2. Scientific efforts by the company to preserve healthy ingredients of the Noni fruit. Can you name any other company like Tahitian Noni International (Morinda) in this field? How can Tahitian Noni® Juice help me? Tahitian Noni® Juice is a natural health product, Tahitian Noni International and its independent distributors are prohibited by the FDA from making any medical claims regarding their products. That includes the listing of specific health challenges that Tahitian Noni® Juice can benefit. Please note that Noni works on the cellular level, which means it can have a beneficial effect on the entire body. To be more specific, research has identified over 150 beneficial nutritious compounds in the Noni fruit, including vitamins, minerals, amino acids, antioxidants, and other important compounds that are currently the focus of intensive research. For more specific information, there are many books, booklets, and tapes that have been published by doctors, researchers, and individuals with extensive knowledge and experience with Noni. Many of these books and booklets can be purchased through Amazon.com, while others must be purchased directly from the publisher. Please contact us for ordering information. How can a fruit juice produce such a wide range of beneficial results? There are some natural foods, plants and herbs that have been proven to provide a wide range of beneficial elements for our health and well-being. And the Noni fruit happens to be one of them because it works at the cellular level. From a medical standpoint, it may help to know that the Noni works at the cellular level, and since our entire makeup consists of different types of cells, it can have a beneficial effect on the entire body. To be more specific, research has identified over 150 beneficial nutritious compounds in the Noni fruit, including vitamins, minerals, amino acids, and antioxidants. Scientists are continually discovering new beneficial elements found in this amazing little fruit ! Why Tahitian Noni International (Morinda) Tahitian Noni® is not available in capsule form? Why did Tahitian Noni International (Morinda) introduce Tahitian Noni® Juice in juice form? Obviously, it would have been much easier, more convenient, and less expensive to formulate a powdered or encapsulated product. However, Tahitian Noni International (Morinda)'s main concern was quality, not convenience. In fact, Tahitian Noni International (Morinda)'s experienced research team spent 3 years and millions of dollars on research and development to bring a superior Noni product to the market. Based on their research and over 2,000 years of historical evidence, it became evident that the only way to bring the Noni to the market would be in its pure, unadulterated form - the way the natives had used it for thousands of years. 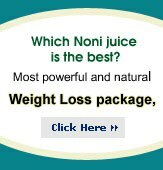 Noni fruit juice loses lots of its beneficial qualities and properties while in the process of making capsules from the juice, which is there in juice itself. Second, liquid is always considered to be the best as it is dissolves faster in the blood stream rather than a capsule which takes longer. "The freeze-drying of biological material, which is to be quantitatively analyzed (micro-amount level) for compounds of low or intermediate molecular weight, should be either imitted or handled under strict control. This is because compounds such as amino acids, sugars, flavonoids, glycosides, coenzymes, peptides, etc., might be removed from concentrates and (or the ground biological material by the high vacuum" (Analytical Biochemistry, June 1983). This means that when a fruit such as Noni is dehydrated, volatile compounds (the compounds that make Noni effective) can and will be lost. Manufacturing dehydration processes are more aggressive than the laboratory scale processes mentioned above. Thus, the loss of volatile compounds is even more evident in commercial powdered Noni products, as demonstrated by the footprints of those products. Furthermore, freeze-drying is one of the more gentle of the dehydration processes. Any other method will cause even greater nutrient depletion than those mentioned in the previous quote. Tahitian Noni® Juice is made from Noni fruit puree directly from Noni fruit. Tahitian Noni International (Morinda) has harvested to preserve its nutritive properties. It is never tampered with-- it remains in its liquid state from harvest to bottle, preserving the live compounds for maximum potency. Tahitian Noni International (Morinda) controls the process from the Noni tree to the consumer's hands, ensuring the most natural and most nutritive Noni product on the market. Tahitian Noni International (Morinda) Inc.
Tahitian Noni International (Morinda) recognized that by having the product in juice form, it would not only allow them to retain the critical elements responsible for producing the beneficial results, but it would also allow the body to readily utilize all of those elements. What are the ingredients of Tahitian Noni® Juice? There are only 3 ingredients in Tahitian Noni® Juice - Morinda citrifolia Fruit Puree, Grape Juice, and Blueberry Juice. The flavoring accounts for only a small percentage of the content of the juice and is necessary to cover the offensive taste of the Noni fruit. Tahitian Noni® Juice contains no preservatives, fillers, artificial flavoring, coloring, or additives of any kind. Try it Now! What is the shelf life of Tahitian Noni® Juice? Tahitian Noni® Juice is packaged in high-quality recyclable glass containers to achieve a shelf life of 18-24 months, perhaps longer, if unopened. If opened and refrigerated, the life of the product is approximately 3 months. Since Tahitian Noni® Juice contains no preservatives, it must be refrigerated after opening to preserve the taste and quality. If I travel, can I take it with me, even if it will not be refrigerated? Many people who are enjoying the benefits of Tahitian Noni® Juice want to continue to do so when they travel. In fact, it is especially important to have Tahitian Noni® Juice with you when you travel, as you are often exposed to new elements that your system is not accustomed to. In most cases, it has been necessary to leave the product un-refrigerated for a period of time until they reach their destination. There have been no reported negative effects from doing so, except for the decline in taste due to the lack of preservatives in the product. In the past, travelers used a hotel ice bucket to keep Tahitian Noni® Juice cold once they reached their destination. However, now many travelers prefer Tahitian Noni International (Morinda)'s Tahitian Noni® Handi-Packs due to their small, convenient size and packaging. Each Handi-Pack comes in a soft juice pack with a re-closable top and contains 8 ounces of Tahitian Noni® Juice. Their convenient size allows you to slip them into a backpack or a purse. With these Tahitian Noni®Handi-Packs, you never have to be without your favorite health supplement. Is Tahitian Noni® Juice tested for safety and purity? Yes, in fact, no other product is put to the rigorous testing that Tahitian Noni® Juice is. Tahitian Noni International (Morinda) uses independent nationally recognized laboratories, such as Corning Hazelton, to rigorously test Tahitian Noni® Juice for over 400 types of contaminants. Just a few of those tests include Gamma Isotope Screening, Heavy Metal Contamination, FDA PAM 410 Fruit & Vegetable Multi-residue Screening, and a Yeast, Mold and Bacteria Screening. These tests assure that Tahitian Noni® Juice is safe and free from all contaminants! Try it Now! Thermal Processing, or Pasteurization, allows Tahitian Noni International (Morinda) to avoid the use of harmful preservatives, and ensure that Tahitian Noni® Juice is safe for everyone to consume! In fact, as of November 5, 1999, if any juice is not pasteurized, the FDA now requires that the juice carry a warning label that reads (although there are few Noni juice companies that comply). "This product has not been pasteurized and, therefore, may contain harmful bacteria that can cause serious illness in children, the elderly, and persons with weakened immune systems." 21 CFR 101.17(g)(2)(ii). You will never see this warning on Tahitian Noni® Juice! While some enzymes are de-natured in this process, Dr. Ralph Heinicke assisted Tahitian Noni International (Morinda)'s scientists in developing a proprietary thermal treatment process designed to allow for thermal treatment while maintaining the integrity of the juice and its critical elements. Competitors often attempt to mislead consumers by stating that pasteurization destroys the Noni's critical elements. However, if that were really true, millions of consumers around the world would not be experiencing life-changing results from consuming Tahitian Noni® Juice, and Tahitian Noni International (Morinda) would not have accomplished an unprecedented sales record of $1 billion in sales in only 5 years! Does Tahitian Noni International purchase their Noni from another source? No. Unlike other companies, Tahitian Noni International (Morinda) prides itself on the fact that they control the process from the tree to the bottle and every step in between. This allows them to ensure that every bottle of Tahitian Noni® Juice is consistently of superior quality. Tahitian Noni International (Morinda)'s process begins when the fruit is harvested. Tahitian Noni International (Morinda) even holds certification courses for the individuals who harvest the fruit. Only once they pass this course are they authorized to harvest fruit for Tahitian Noni International (Morinda). Once the fruit is harvested, it undergoes a rigorous four-step quality control process. First, the picker inspects the fruit to ensure that it meets Tahitian Noni International (Morinda)'s high standards for ripeness and quality. Next, this process is repeated before the fruit is transported to Tahitian Noni International (Morinda)'s processing facility on the main island of Tahiti. When the fruit arrives at the docks in Tahiti, it is inspected and approved a third time. Finally, when the fruit arrives at the processing facility, it receives a final inspection. At each stage of this process, fruit that does not match Tahitian Noni International (Morinda)'s standards is eliminated, leaving only the highest quality Morinda citrifolia fruit remaining. Tahitian Noni International (Morinda)'s processing plant in Tahiti is a state-of-the-art facility designed to produce the highest quality Tahitian Noni® products. As the fruit is processed, the preliminary result is a very thick Noni puree resembling very thick applesauce. This puree is extensively tested to ensure that it is free of any impurities or microorganisms. Then it is placed in aseptic containers for shipment to Tahitian Noni International (Morinda)'s processing facility in Southern California. Upon arrival in California, samples of the puree are carefully tested once again before the final stage of production. Then Tahitian Noni International (Morinda)'s exclusive flavoring system of clean and pure fruits is added along with purified water to achieve the flavor and final consistency for Tahitian Noni® Juice. Once the bottling process is complete, each bottle receives an individual quality assurance number. This allows Tahitian Noni International (Morinda) to trace each bottle back to the batch, the island, and even the harvester involved in the production of that bottle. Overall, statistics show that 9 out of 10 people benefit from drinking Tahitian Noni® Juice. However, doctors who are more experienced with the use of Tahitian Noni® Juice believe that EVERYONE would get results if they drank enough of it and drank it long enough. In addition, they have found that the longer individuals drink Tahitian Noni® Juice, the greater the results. For these reasons, they recommend that everyone make a commitment to drink Tahitian Noni® Juice for at least 90 days. When I can expect to notice results? Everyone is unique - some people will notice a difference immediately, while others will take longer to experience the benefits of Tahitian Noni® Juice. For that reason, we recommend that everyone make a commitment to drink Tahitian Noni® Juice for at least 90-120 days. How much should I drink and can I drink too much? Tahitian Noni® Juice is a natural food supplement and NOT a medication. Therefore, no dosage instructions can be given. However, the recommendation printed on the bottle of Tahitian Noni® Juice is one ounce per day, since that is the amount that most people use to experience the desired benefits. Some people choose to drink more so that they can derive faster, more dramatic results. For further information, there are many independent doctors who have extensive experience with Tahitian Noni® Juice who offer booklets and tapes with more information about using the product in ways to derive the greatest benefit. You may want to increase the amount if you want faster results. It is safe for almost everyone. If you have any concerns, please see your doctor before use. It can be mixed/diluted with water if you want to.Buy Now! Are there any instructions on how should I drink Tahitian Noni® Juice? As stated above, Tahitian Noni® Juice is a natural food supplement, and NOT a medication. Therefore, no specific dosage instructions can be given. However, through extensive research, many scientists and doctors have discovered that there are ways to maximize the benefits of Tahitian Noni® Juice. For instance, Dr. Ralph Heinicke, a scientist with extensive experience with the Noni, recommends drinking Tahitian Noni® Juice on an empty stomach for at least 20 minutes to allow the Noni's critical elements to pass through the stomach unharmed by digestive acids and without interference from other substances. Many healthcare professionals have noted that their patients derive far greater benefits by drinking Tahitian Noni® Juice first thing in the morning on an empty stomach. The only thing they recommend consuming along with Tahitian Noni® Juice is your other nutritional supplements. It is also interesting to note that the native healers also recommend drinking the Tahitian Noni® Juice after periods of rest and peace to derive the greatest benefit. For further information, there are many independent doctors who have extensive experience with Tahitian Noni® Juice who offer booklets and tapes with more information about using the product in ways to derive the greatest benefit. Please ask the person who shared this information with you about those independent resources. Can I mix Tahitian Noni® Juice with other beverages? To derive the full benefit from drinking Tahitian Noni® Juice, it is better to consume it as is. However, if an individual finds the taste unpleasant, it is better to mix it with another juice than to not consume it at all. Grape juice masks the taste of the Noni fruit better than most juices. Does Tahitian Noni® Juice have any side effects? Tahitian Noni® Juice is a tropical fruit juice. Those people who are allergic to fruit juices, may be allergic to Tahitian Noni® Juice. We are not aware of any other side effects. Will Tahitian Noni® Juice affect my medications? Tahitian Noni® Juice does not have any contraindications. There have been no reports of any interactions with medications. That includes the many medical professionals who use Tahitian Noni® Juice with their patients who take a variety of medications. However, Tahitian Noni® Juice has been shown to increase the cells' ability to absorb more of everything including nutrients from food and vitamins. NEVER adjust or discontinue your medications without your doctor's consent! Do I still have to take my other nutritional supplements? While Tahitian Noni® Juice does contain a tremendous amount of nutritional benefits, taking other nutritional supplements along with Tahitian Noni® Juice actually enhances the benefits of both. They work synergistically in the body as Tahitian Noni® Juice dilates the cell wall openings to absorb and utilize more of those nutrients. In turn those healthy cells respond even more readily to the benefits of Tahitian Noni® Juice in the body. How big is the bottle of Tahitian Noni® Juice? It is 33 oz and will last you 1 month. Consumption is only 2 tablespoons per day. If Noni grows in other parts of the world, why was Tahiti and French Polynesia selected as the source of our product? The Islands of French Polynesia represent one of the last pure, pristine environments in the world. Many of these islands are uninhabited and remain much the same as they have for centuries. The air is pure, the water clean, and the soil is a unique combination of rich coral and volcanic elements. The Morinda Citrifolia trees grow taller and more lush. The fruit is larger and more symmetrical. (This is why Morinda Citrifolia plants come from a MUCH higher b/c grade soil content then Noni available in other forms.) The source is more plentiful. Are there some people who shouldn't drink it? Tahitian Noni® Juice is a tropical fruit juice. Those people who are allergic to fruit juices, may be allergic to Tahitian Noni® Juice. If you are allergic to citrus fruits or exotic fruits, you should take a minimum amount to see if you have any reactions. Can you buy it at a health store? NO, it is not available in health stores. We offer the BEST PRICES on Tahitian Noni International Tahitian Noni® Juice. Chat Live for more information. Try Tahitian Noni® Juice Now! Is Tahitian Noni® Juice CERTIFIED ORGANIC? The Tahitian Noni® Juice is not CERTIFIED ORGANIC. But it is also NOT harvested. There are no pesticides used at all...this fruit is hand picked in its natural habitat...mostly on secluded, uninhabited islands (NO one lives on these islands). They are in their natural state untouched by toxic residue of any kind. Try it risk Free....30 days money back guarantee! As demand builds will you run out of Noni fruit? No. It grows abundantly and is harvested 365 days a year. It's not like an apple tree that gives you one harvest a year. And there are hundreds of tiny islands scattered across an area as big as Europe where Noni grows.